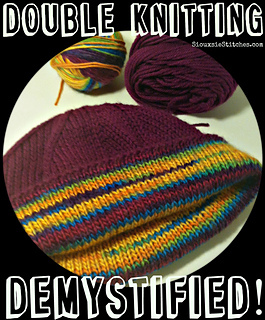 I’ve created this simple hat pattern as a gentle introduction to the technique of double knitting, which essentially produces two “right sides” of a garment at the same time, thus making said garment reversible. Although double knitting is frequently used as a method of creating colorwork as an alternative to stranded knitting and intarsia, this pattern intentionally focuses only on producing two plain and simple stockinette sides for the purpose of getting you used to the technique. The result is a thick and squishy reversible hat that will keep you toasty on the coldest of days to come!